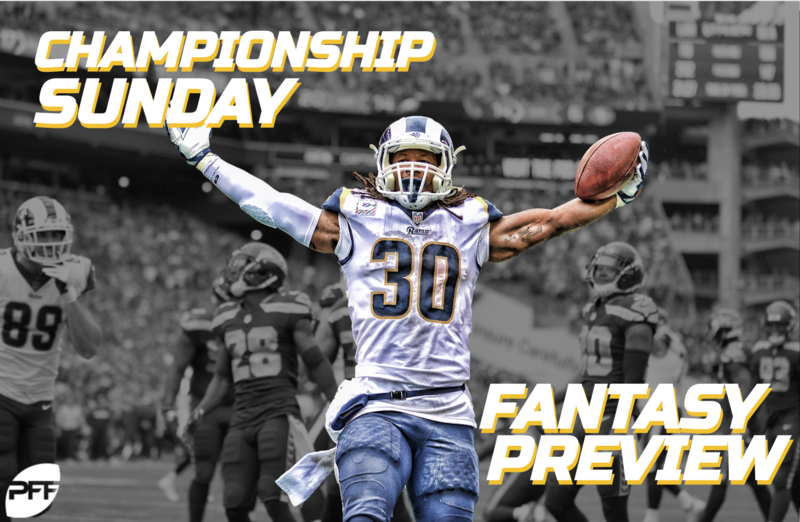 This week, for the Conference Championship Round of the playoffs, we’ll be breaking down each team at each positional grouping and examining their DFS value and fantasy football upside on both DraftKings and FanDuel. This season, when at home, Drew Brees (DK: QB2, FD: QB2) leads all quarterbacks in fantasy points per game (24.3) and passer rating (129.1). Well, he’s home again this week and with the highest implied point (29.75) total of the slate. The Rams are probably the toughest matchup on the slate (for quarterbacks), but still slightly above average when including all other 31 teams. Brees is our No. 2 quarterback in our projections, but still far enough behind Patrick Mahomes that he’s also our No. 2 quarterback in terms of value on both sites. It’s a closer call on DraftKings ($800 behind Mahomes), but less so on FanDuel ($200 behind Mahomes). The Rams are something of a run funnel defense. They rank middle of the pack in opposing passer rating (93.1, 18th) but fourth-worst in yards allowed per carry (4.87). However, the over/under (56.5) and spread (-3.0) implies a pass-heavy shootout, which would suit Alvin Kamara (DK: RB2, FD: RB2) far better than Mark Ingram (DK: RB7, FD: RB7). Last week, with similar gamescript, Kamara played on 69% of the snaps, while drawing 16 of 25 carries and four of the team’s six targets out of the backfield. He scored only 14.6 fantasy points but also had a 46-yard touchdown catch negated by penalty. Even with mostly tremendous gamescript, Ingram hasn’t reached 15 touches in any game since Week 11. Still, he’s in play on FanDuel if you think New Orleans dominates this game. Kamara has seen better volume, averaging 12.0 carries and 7.2 targets per game over his last five games. He’s always in play due to unparalleled hyper-efficiency and slate-busting upside, but especially this week at a price tag of only $6,500 on DraftKings. That’s over $1,800 less than his average salary this year. We’re really only looking at two of New Orleans’ receivers this week – Michael Thomas (DK: WR1, FD: WR1) and Ted Ginn (DK: WR6, FD: WR9). Since Week 4, Thomas has seen 13 or more targets four times. Across the other 10 games, he averages just 6.6 targets per game. Last week, Thomas destroyed Philadelphia’s bottom-ranked secondary to the tune of 12 catches (on 16 targets) for 171 yards and a score. His matchup won’t be as good this week, but Los Angeles is still a more favorable matchup than not. The Rams rank 10th-worst in schedule-adjusted fantasy points per game to opposing wide receivers and fifth-worst to opposing WR1s. However, the matchup might be even better suited to Ginn’s skillset. In terms of fantasy points allowed to opposing wide receivers on deep passes, the Rams rank third-worst on a per-game basis and worst on a per-target basis. 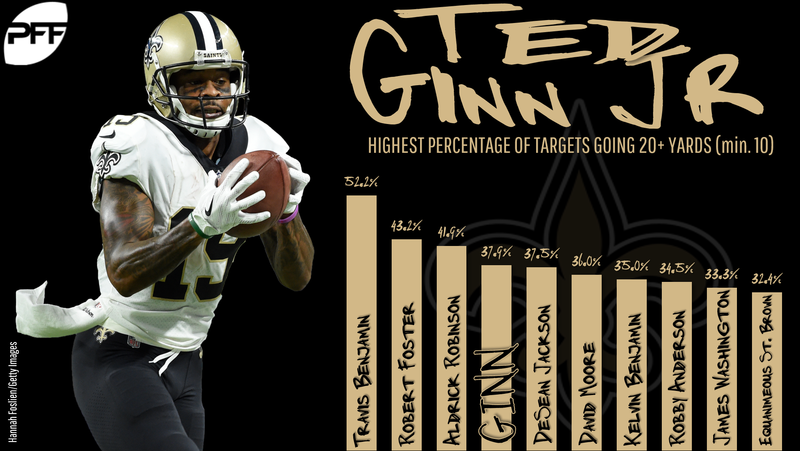 In full games, Ginn is averaging 13.2 expected fantasy points per game, which would have ranked 19th-best among all wide receivers this season. He’s a top value on both sites. Los Angeles went ridiculously run-heavy last week, passing only 37% of the time (the league average is 59%). That seems unlikely to repeat this week, as 3.0-point underdogs up against a Saints defense that ranks second-best in yards allowed per carry (3.22) and seventh-worst in opposing passer rating (99.3). Indeed, the Saints are the league’s top pass funnel defense allowing 77% of their total yardage to come via the pass (most). Even so, Jared Goff (DK: QB4, FD: QB4) is probably the worst play at the position. He averages only 11.4 fantasy points per game over his last six games. He’s also averaging only 13.7 fantasy points per game on the road this year, as opposed to 23.2 fantasy points per game at home. Still, on such a short slate, he deserves consideration as a contrarian play. Last week, C.J. Anderson (DK: RB6, FD: RB6) led the team in carries with 23, totaling 123 yards and two touchdowns. Todd Gurley (DK: RB1, FD: RB1) saw 16 carries and two targets, totaling 118 yards and a score. I, uhhh, yeah… I did not see that coming. Apparently, head coach Sean McVay told Joe Buck, that due to “a cardio issue” Gurley could be limited. This usage and Anderson’s success (three straight 100-yard games, 6.4 yards per carry) make Gurley risky as the slate’s highest-priced running back. Still, Gurley shouldn’t be as limited as he was last week, was also hyper-efficient last week, and is Todd Gurley. Gurley is also the more capable pass-catcher, and New Orleans has seen 42% of their fantasy points allowed (to running backs) come via the pass (most). I wish I had a better read on this situation, but I don’t. My instinct is to try to play him despite all of the concerns, because he’s Todd Gurley, he’s historically cheap, and likely to draw low ownership. Last week, all of Robert Woods (eight targets, 12.9 fantasy points), Brandin Cooks (six targets, 10.5 fantasy points), and Josh Reynolds (four targets, 2.9 fantasy points) disappointed. This was to be expected of Woods (DK: WR4, FD: WR4) and Cooks (DK: WR5, FD: WR5) in tough matchups, but Reynolds’ (DK: WR7, FD: WR8) volume and production was especially distressing. 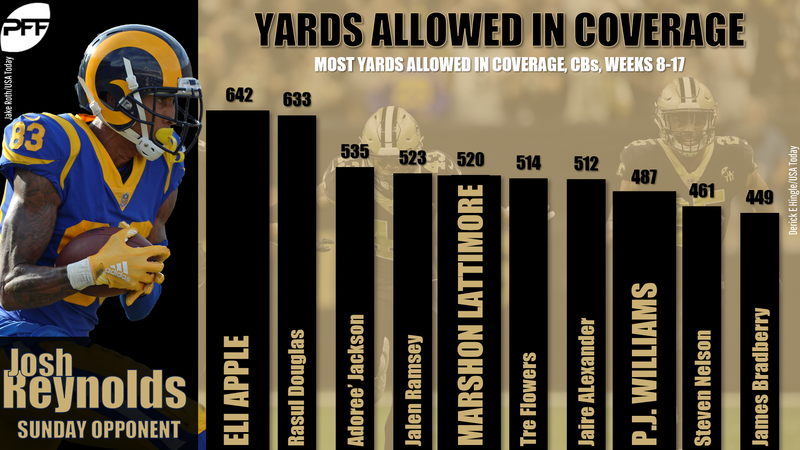 Reynolds has a soft matchup again — with Cooks likely to be shadowed by Marshon Lattimore — up against Eli Apple for the majority of the game. Apple ranks as our 11th-worst-graded cornerback since joining New Orleans (of 64 qualifying). Reynolds has actually seen better volume than Cooks since the Cooper Kupp injury (Week 10) but has also been less productive. As was the case last week, he’s risky but still a strong tournament value. Woods’ matchup is also fairly soft, as New Orleans ranks 13th-worst in fantasy points per game allowed to opposing slot wide receivers (where he’s run 72% of his routes since the Kupp injury). Since that injury, Woods ranks 13th among wide receivers in expected fantasy points per game (15.3) and 14th in actual fantasy points per game (16.0). Among all wide receivers available on the slate, that ranks fourth on both sites, which means he’s probably appropriately priced. The weather forecast for Kansas City on Sunday night is not looking very conducive to fantasy production. Temperatures are supposed to range from -5 to 10 degrees with wind speeds up to 10 mph. The coldest NFL game of Patrick Mahomes’ (DK: QB1, FD: QB1) short career came in Week 14 against the Ravens (27 degrees), where he gashed the league’s best pass defense to the tune of 377 yards and two touchdowns. Even with weather concerns, it’s hard not to drool over Mahomes’ $6,600 salary on DraftKings. Including the postseason, Mahomes averages 28.2 DraftKings fantasy points per game and 26.3 FanDuel fantasy points per game. Both numbers rank best by any quarterback all-time. That’s also 6.2 and 5.8 fantasy points better, respectively, than the next-closest quarterback on the slate. Kansas City’s offense has actually performed slightly better on the road (a function of playing much better defense at home), but New England’s defense has been drastically worse on the road. This year, they’re giving up 20.5 fantasy points per game to opposing quarterbacks on the road, which ranks eighth-worst. I think Mahomes is worth paying up for this week, but it is a close call between him and Brees. If he busts, it’s because of one thing in particular. Mahomes has been the league’s most pressure-sensitive quarterback this year, ranking best of 29 qualifying quarterbacks in clean pocket passer rating but only 18th in passer rating when pressured. The Chiefs offense ranks 13th-worst in pressures allowed per dropback, while the Patriots defense ranks ninth-best in pressures forced per dropback. Still, Mahomes dropped 27.0 on New England (in New England) the last time these two teams faced off. As was the case last week, this situation will be muddied if Spencer Ware (DK: RB8, FD: RB8) returns. You can find my full thoughts on what that means if he does return here. Though, I think even if he does return, this is mostly Damien Williams‘ (DK: RB3, FD: RB5) backfield to own. Last week, Williams played on 77% of the team’s snaps, drawing 25 of 28 carries and all six of the team’s targets out of the backfield. This was good for 21.6 expected fantasy points and 26.4 actual fantasy points. If Ware is out, Williams is again a borderline must-play (slightly more so on FanDuel), priced as the cheapest of the bell cows. (He should also benefit more from the inclement weather.) If Ware plays or we’re still uncertain come Sunday afternoon, I still expect to be overweight on Williams compared to the rest of the field. So, we know New England likes to sell out to stop an opposing team’s top offensive weapon. 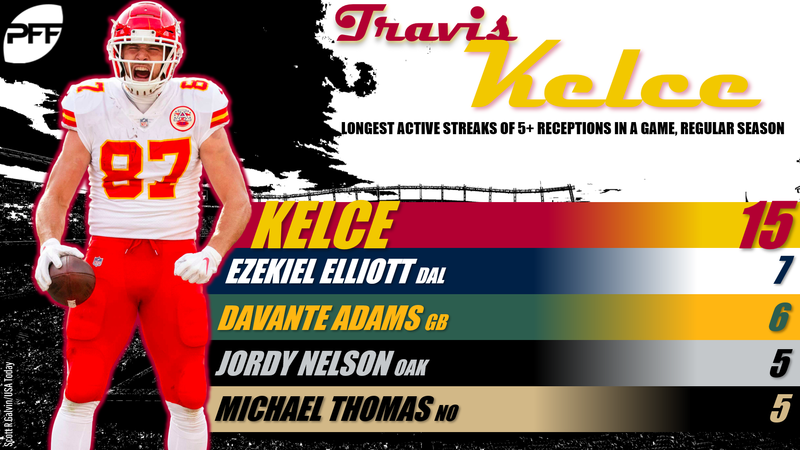 Earlier this year (Week 6), that was Travis Kelce (DK: TE1, FD: TE1), who was held to just five catches and 61 yards on nine targets. Tyreek Hill (DK: WR2, FD: WR2), meanwhile, exploded for seven catches, 142 yards, and three touchdowns (on 12 targets). For whatever reason, in this game, New England had Stephon Gilmore (our No. 1 graded cornerback this year) shadow Sammy Watkins (DK: WR8, FD: WR6) and not Hill. The extreme cold might make deep ball connections more difficult for Hill, or maybe, we should just stop discounting Mahomes and his ridiculous arm strength. On paper, the matchup is softer for Kelce. The Patriots rank eighth-worst in schedule-adjusted fantasy points per game to opposing tight ends but are middle-of-the-pack to WR1s. Given the loose pricing this week and the lack of reliable options at the tight end position, Kelce will probably be the highest-owned player on the slate. He’s behind only Thomas and Kamara in our projections, so it’s not without good reason. If fading him, it’s likely entirely due to ownership, but I actually like this strategy quite a bit. I’d bet Hill ends up with more fantasy points for the day and I like that Hill might go low-owned coming off a tough matchup and due to weather concerns. It’s also, to me, glaring, that the Patriots have never had an answer to Hill. For his career, he averages 32.8 fantasy points per game against the Patriots (two games), while Kelce averages only 9.5 fantasy points per game in his last three games against them. Tom Brady (DK: QB3, FD: QB3) also has to worry about the weather, but likely less so than Mahomes due to experience. Brady is 24-4 for his career when the weather dips below 30 degrees. However, he has the unfortunate drawback of facing the Chiefs in Arrowhead. In three career games at Arrowhead, he averages just 240.7 passing yards, 1.0 touchdown, and 2.0 interceptions per game. 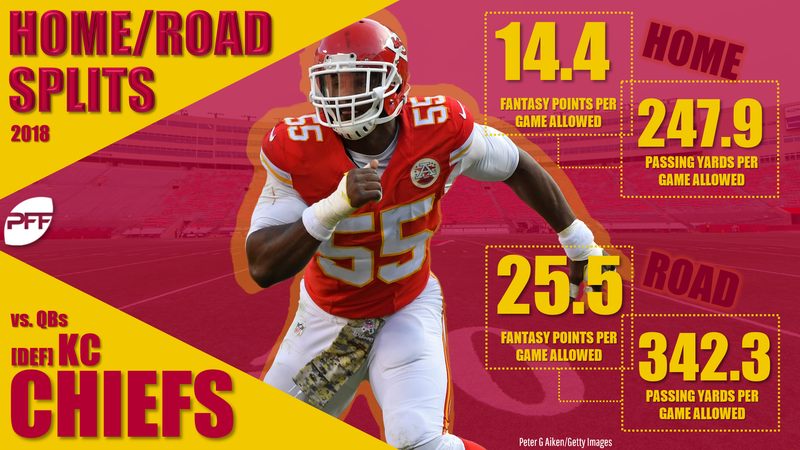 This year, the Chiefs are allowing just 14.1 fantasy points per game to opposing quarterbacks when at home, which ranks sixth-best. Brady was a massive fantasy disappointment this regular season, averaging just 18.7 fantasy points per game (17th-best), but graded highly (fourth-best). He also tore up a stout Chargers secondary last week to the tune of 343 yards, one touchdown, and zero interceptions. He now averages 25.0 fantasy points per game over his last six postseason games. The Chiefs also rank worst of all 32 NFL teams in schedule-adjusted fantasy points per game. That looks great for Brady, but this is partially due to their offense always putting up big numbers and their egregious home/road splits. In last week’s game against the Chargers, we saw Burkhead (DK: RB10, FD: RB9) take a backseat role, playing on only 13% of the snaps. Sony Michel (DK: RB4, FD: RB4) totaled 129 yards and three touchdowns on 24 carries. White (DK: RB5, FD: RB3) saw a whopping 17 targets, catching 15 for 114 yards. Their usage last week made a lot of sense in hindsight, with all of the other receivers in tough matchups. They’ll all have good matchups again this week and should all benefit from the poor weather. The Chiefs rank worst in yards allowed per carry (4.96) and third-worst in receiving fantasy points per game allowed to opposing running backs. Michel is the better bet if you think New England wins and/or the weather makes things tougher on each offense, while White is the better play if you think Kansas City walks away with the victory and/or this is a high-scoring pass-heavy affair. Julian Edelman (DK: WR3, FD: WR3) overcame a tough matchup to catch nine of 13 passes for 151 yards. Including the postseason, he now ranks 10th among wide receivers in fantasy points per game (17.9). He’s reached at least 15.9 fantasy points in nine of his last 10 games. He’ll be a top option this week in a slightly above average matchup. The weather also shouldn’t hurt him too much due to the low-depth-of-target nature of his role. Phillip Dorsett (DK: WR9, FD: WR7) and Chris Hogan (DK: WR10, FD: WR10) are just touchdown-or-bust punt plays this week. The tight end position is an absolute wasteland beyond Travis Kelce. Rob Gronkowski (DK: TE2, FD: TE2) might be the cheapest he’s ever been on either site but is risky as an apparent shell of his former self, earning a career-low PFF grade this year and failing to eclipse 25 receiving yards in each of his last four games. Kansas City ranks second-worst in schedule-adjusted fantasy points per game to opposing tight ends, but if Eric Berry suits up, this would be a below average matchup for Gronkowski. If making only one lineup, I’m prioritizing Patrick Mahomes. If making multiple lineups, I’ll split ownership between Mahomes, Brees, and Brady, while still being most heavily exposed to Mahomes. Of the running backs, I expect to be most heavily invested in Damien Williams, James White, Alvin Kamara, Todd Gurley, and Sony Michel (in some sort of order, and likely having one of these running backs in the flex). Of the wide receivers, I’ll be keyed in on Tyreek Hill, Michael Thomas, Julian Edelman, Robert Woods, Ted Ginn, and Josh Reynolds (in some sort of order). I’ll still have some Travis Kelce lineups, but I like the ownership-related edge offered in fading him. On those lineups where I’m fading him, I’ll just punt the position entirely and hope the rest of my players make up for the 2.3 fantasy points Gerald Everett (DK: TE3, FD: TE6) is sure to bring me. Outside of that, with pricing so loose, I don’t see much value in any of the cheapest options this week. Finally, I can’t stress enough the importance of late-swap on these smaller slates. If you have any tournament lineups that seem unlikely to cash after the first game, you have nothing to lose and everything to gain by adding exposure to some “riskier” lower-owned players.